The Pi Eye Kit does not include the Raspberry Pi, Camera or Power Supply. It does not include the Sense-Hat, Sense-Hat GPIO Extender, Mounting Stand or HDMI cable. It does not include an artistic “skin” covering. 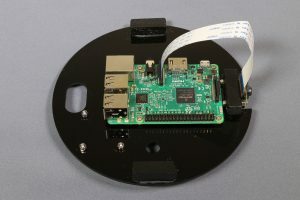 View of the main support plate with a Raspberry Pi installed. You will also need some tools and supplies to finish this kit: a drill and rotary tool, metric hex wrenches, acrylic epoxy, gloss black enamel (optional), mounting stand with hardware.